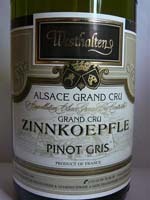 This Pinot Gris Zinnkoepflé from Cave de Pfaffenheim is a semi-dry white wine that shows a golden color. Its powerful nose offers yellow fruits and honey scents. The attack is frank and the wine fills the mouth with velvety feelings based on a nice fruity and acidity balance. It has an elegant sweetness and a long persistence.